How many events do you have at The Pointe each weekend? Just one – yours! We reserve the entire resort for the weekend for your family reunion only. You will never be competing with any other guests for attention or space. How many guests will The Pointe accommodate? Our cathedral cabins and lodges can accommodate up to 150 overnight guests. Can you recommend a caterer for us? Yes we can. There are certain caterers that are more familiar with our property and that we highly recommend. We would love to share them with you. Is there a curfew for music or time that my family reunion must end each night? No! One of the wonderful perks of our resort is that you have full usage of the property throughout your entire stay. You may feel free to stay up as late as you like. Go ahead, catch up with your family. That’s what you’re here for anyway! May we bring our RV? At this time there are no RV hookups available on-site. We're bringing our boat. Is that okay? Absolutely! We have a boat ramp with Canyon Lake access directly on the property. 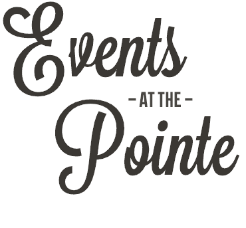 For more information about having your event at Events at The Pointe please contact us.